Newlight Photonics manufactures anti-reflection (AR), highly reflective (HR), partial reflective (PR) coatings at single wavelength, multiple wavelengths, or in a range of wavelength (broadband). Please contact us for your coating requirements. Traditional electron-beam and thermal evaporation are the most widely employed methods for producing thin films because of their simplicity and relatively low cost. Here, a coating material is heated either resistively (for metals) or through electron beam bombardment (for dielectrics) within a high vacuum chamber until it vaporizes. This vapor then streams away from the source and recondenses on all surfaces that are in a line of sight with the source to make a coating. This method of evaporation is a relatively low energy process. IAD is a variant of the electron-beam evaporation process which adds a high energy ion beam that is directed at the part to be coated. These ions act almost like an atomic sized hammer, producing a higher film density than can be achieved with purely by evaporation alone. The ion beam can also be used to pre-clean or etch the surface of the substrate, which can improve film adhesion. The result of higher coating density is improved mechanical durability, greater environmental stability and lower scatter than films produced using just electron beam evaporation. 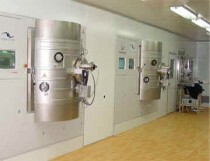 IBS coatings are produced in a vacuum chamber. In IBS, a high energy ion beam is directed at a target, typically composed of a metal or oxide. The ions transfer their momentum to the target material, causing atoms or molecules to sputter off. These high energy atoms then deposit onto the parts to be coated. The high energy of the ion beam sputtering process results in extremely uniform, high density, completely amorphous films with excellent adhesion to the substrate. This translates into high environmental stability and mechanical durability. Note: Each of these techniques possesses its own unique advantages and limitations. Please discuss with us for the technique that best meet your requirements.